The next upcoming Ramadan starts on sundown of May 5 ending at sundown on Tuesday June 4th, 2019. Ramadan is in the ninth month of the Islamic calendar. It is a month of fasting, prayer, giving and self-evaluation observed by Muslims. The month lasts 29-30 days depending on the sightings of the crescent moon. Ramadan represents a time of fasting, prayer, and devotion to the Muslim religion. It is one of the Five Pillars of Islam. People are encouraged to read the Qur'an entirely during this time. It is a time for charity and many Islamic organizations take part in giving of clothing and food to the schools and homeless shelters. Islamic businesses and groups may arrange schedules for prayer times during this month. 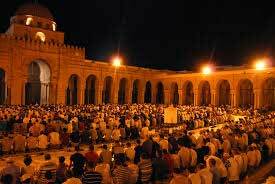 Ramadan is the most blessed and holy month of the Islamic calendar which consists of 12 months of 354 days. The month begins with the sighting of the new moon. Many Muslims avoid food, drink, and certain activities during the day time. The Qur'an was revealed to the Prophet Muhammad during this time. Ramadan ends with the sighting of the crescent of the next new moon. Eid-al-Fitr holiday marks the end of Ramadan.